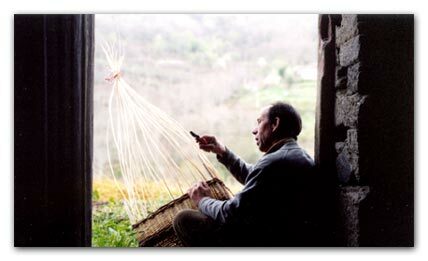 Anna´s and Luis´workshop is at Cristosende where Luis works on his traditional baskets and Anna weaves her woolen and linen textiles. 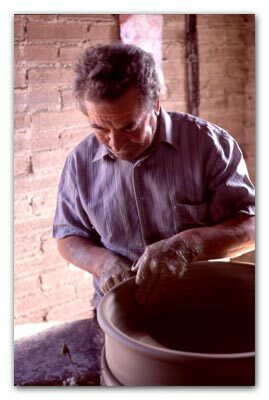 The so called "cachareiros" (pottery makers) of Niñodaguia elaborate pieces of pottery, trying to find a balance between the sense of usefulness and the sense of beauty at their workshops. In Maceda there are only two craftsmen left who do this special kind of leatherwork which was so very much linked to cattle raising and agriculture in former times. There are two tinsmithers at A Peroxa and El Pereiro de Aguiar. There is one workshop where the knife-grinders´ wheels are manufactured at Luintra (Nogueira de Ramuin). This municipality is also known as "A Terra da Chispa" (the land of spark makers) in honor to the knife-grinders who travelled all over the world with their "tarranzanas".